This is bizarre Mars. We’re back on the red planet this month, and a look at the more bizarre [and sometimes humorous] claims currently made about some of the latest photographs we are getting from our near neighbor. There is no doubt in my mind that we will probably find some kind of life on Mars, but that’s mainly because I believe life is extremely tenacious at forging a hold for itself. Advanced intelligent life from the distant past is another thing altogether. However, I am quite willing to explore the situation with an open mind, with one cynical look over my shoulder at Photoshop and the like. 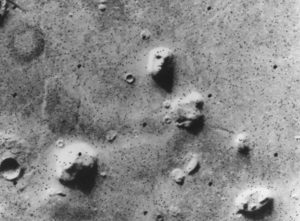 NASA’s Viking 1 Orbiter flew near Mars in 1976 and took the now famous image of the surface which appeared to show a face-like formation in the upper centre of the picture. If you have a creative mind, it’s easy to see it as having two eyes, a nose, a mouth and a cute hairdo. 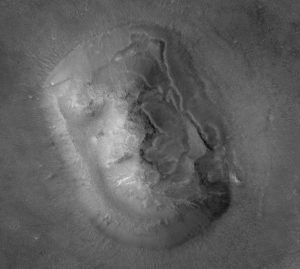 The Mars Global Surveyor cleared things up for good in 2001 by taking a fresh image of the face [shown above, on the right]. The newer, sharper, higher-resolution picture shows a much less distinct, less stark formation. Such is the power of pareidolia — a phenomenon that causes people to see recognizable faces and shapes in unrelated objects — to find familiar sights on Mars. 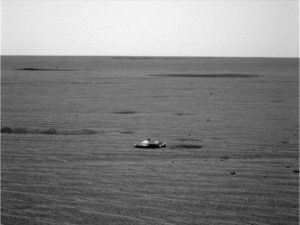 A peculiar jet appears far back in this scenic Mars landscape photo taken by NASA’s Opportunity Rover in 2016. 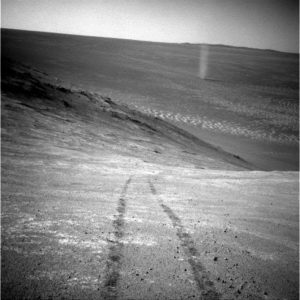 It’s actually a dust devil, much like we experience here on Earth. Towering dust devils are weather hazards on Mars and they’re something future human visitors will need to be prepared to handle. 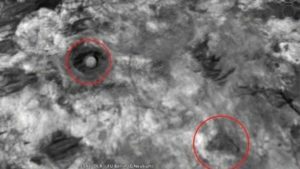 In the video ArtAlienTV says that many of the potential domes found on Mars have turned out to be sand dunes. 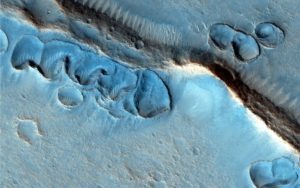 Bizarre Mars – Sharp Image! If it looks odd, so it must be aliens! But at least in this case the resolution is reasonably crisp. Not a blurry image like most UFO ‘evidence’. “Looks like light glimmering off of a genuine spaceship on an alien planet in outer space,” one commentator noted. A more down to Earth (even though it is Mars) suggestion was that it could be a piece of debris from the rover itself, or a heat shield from the craft that delivered it. These odd and tortured raised ridges both look strange and leave scientists without any good explanation as to how they formed. Some say they might have been left behind by an ancient ocean or perhaps ancient glaciers. For now, the formations remain a mystery. The more we explore our near planetary neighbor, the weirder things become. NASA’s Mars Reconnaissance Orbiter, which has been circling Mars since 2006, provides clear and highest-resolution images of the planet’s surface. A note on the colours in this image: HiRISE has cameras that see in slightly different wave-lengths than our own eyes. A lot of the photos it produces are in “false colour,” meaning the different wavelengths have been assigned colors for purposes of clarity. There are no actual turquoise dunes on Mars. But the false colour pictures do allow scientists to differentiate various textures and materials on Mars.